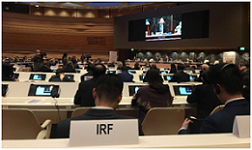 Automation in transport was the theme of the high-level segment that opened the 81th session on the Inland Transport Committee of the United Nations Economic Commission for Europe (UNECE) in Geneva on 19th February. IRF was invited to share its view with the Ministers and 400 other representatives of governments and key transport stakeholders from over 70 countries present at the meeting. The HLS concluded with the adoption of a resolution on Enhancing Cooperation, Harmonisation and Integration in the Era of Transport Automation. In her keynote speech, Mrs Cora Van Nieuwenhuizen, Minister of Infrastructure and Water Management of the Netherlands, stressed that road safety comes at the top of the list when we look at automation, and that “If we want to give smart mobility wings, then our infrastructure has to be right”. Addressing the high-level segment, Susanna Zammataro, IRF Director General said “The development of a comprehensive global/regional policy framework on automation in transport is of critical importance to guide national and local authorities in addressing these issues. High-level dialogue with industry and academia is equally important in this process. We believe that UNECE is well placed to foster the collaboration needed for the development of long-term, people-oriented transport outcomes”. IRF DG concluded by underlining that “We need to put people back at the centre in planning for our mobility systems. Access and affordability are two key issues and so is people’s engagement in decision making processes”. Aiming at capitalising on the potential of automation in inland transport and to accelerate the implementation of the 2030 Agenda for Sustainable Development, Ministers and Vice Ministers of transport and representatives from 31 countries adopted a resolution on “Enhancing Cooperation, Harmonization and Integration in the Era of Transport Automation.". Other countries from Africa, Asia, Europe, Latin America and the Middle East have also expressed their interest in signing the resolution. Later on during the week, the Inland Transport Committee also reached consensus and adopted its 2030 Strategy. This new strategy is meant to create a worldwide framework for inland transport that is safe, sustainable, accessible, and a benefit to all societies.